It would be rude to release poor Adam Maitland without his beloved wife Barbara, but then, this is Funko, the company that released Kirk and Spock a year apart. So it seemed Adam would be alone for the time being - enter Hot Topic! 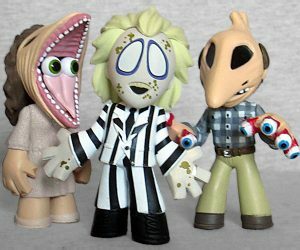 As they do so often, Hot Topic got a few exclusive Mystery Minis in Series 3: the Bride of Chucky, a glow-in-the-dark Slimer, and Barbara Maitland. This time the exclusives were all in a 1:12 ratio (meaning them were in every case), but that still didn't make Barb easy to get: it seemed that each Hot Topic store was allotted only one case of figures; if you weren't there the moment it was opened, then she was gone. Thanks, Obama! But more importantly, thanks Wolf for helping me get this figure when no one else could. 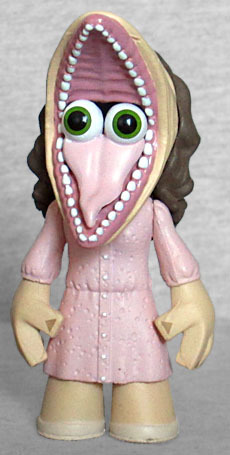 Barbara Maitland was played by Geena Davis, and if Stewie Griffin thought she showed "too much gum" when she smiled before, this must drive him insane! Her idea for a gruesome haunt was to roll her eyes back into her head, stretch her mouth open, and have the eyes pop up on her tongue. 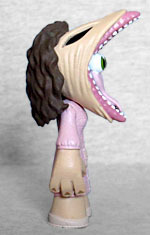 Really, other than the eyes in her throat, this could almost pass for a caricature of Aerosmith's Steven Tyler. While the face is good, her body isn't - the dress she wore through the film had a floral pattern, but here it's just painted pink. She didn't wear pink, she wore white with pink and green on it. At no point during the film does her dress actually look "pink." They'd have been better off painting it gray and then speckling pink and green on it (that's what we did in Photoshop for the group shot below). Plus, the sleeves should stop at her elbows, not her wrists. Then, on top of all that, her pose is very straightforward, just her standing there with her arms at her sides. They couldn't even bend her arms a little? Due to her scarcity and the fact that she completes a set, Barbara commands a pretty substantial price on the secondary market. That price would be a lot easier to swallow if the figure itself were done better. 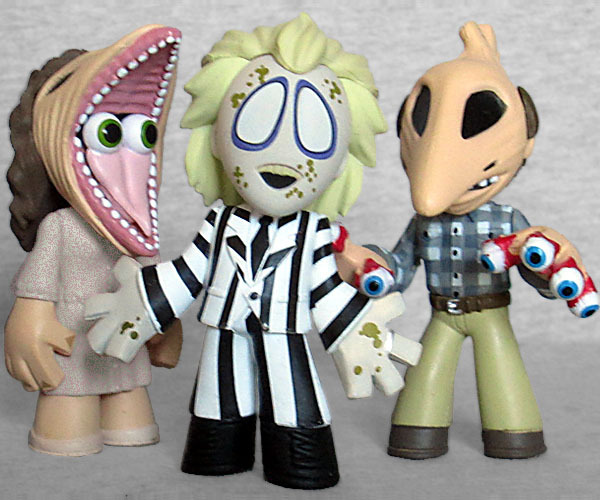 This entry was posted in blog exclusive review, Funko, videos and tagged Beetlejuice, Mystery Minis. Bookmark the permalink. No worries -- happy to help mate! Let this be a lesson to everyone: send us toys, get the warm feeling of an off-hand mention. REWARDING! Mystery Minis Adam Maitland gives us our second ALEC Baldwin toy!